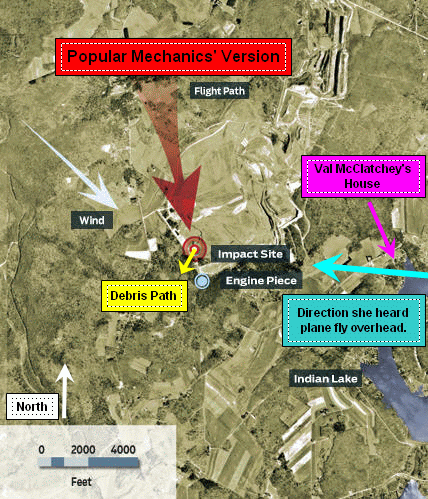 With all the chaos I recently created with my analysis (just updated) of Val McClatchey's infamous Flight 93 photo that just made headlines in the mainstream media, new details have emerged in this new Pittsburg Post-Gazette article and from a video interview of Val [source] that I was just made aware* of that deepens the mystery of Val's photo. The Post-Gazette article mentioned that the reason Val took only one photo of this historic event was because she "dropped" her camera after taking the photo and her battery fell out. It also says she "didn't even aim" when taking her shot. Just look at her photo, does it look like someone who was sitting on the couch who just heard a horrendous explosion and immediately jumped up and raced out the door with their camera, blood pumping and adrenaline running, was able to take such a perfectly lined-up and steady shot as if it were on a tripod and she was anticipating the shot? The article then mentions that she then printed out a copy of her photo and brought it to the state police after she heard them put out a call for any evidence of the crash. This was interesting at first because it seems to suggest this happened the same day which would make it seem unlikely Val would have time to devise a sinister plan to doctor a photo of the event and jump on her computer to photoshop a smoke plume on an empty landscape shot. However, it turns out this call the police put out wasn't until days later. She also says the photo sat in her camera "for days" before she realized what she had taken. So technically, this does give her time to devise a scheme and doctor this photo. So now we have the FBI's hands all over this photo and this is good news for Val because maybe she took a legitimate shot of something the Feds didn't want anybody to see and they doctored the real smoke plume that Val had taken. Maybe her photo had to do with something relating to the plane she heard fly over-head in the wrong direction of Flight 93's alleged path right before the explosion happened? But there is another aspect that's been unknown that is needed to determine if Val could have taken this photo in the first place; how long did it take her to snap the photo after she heard the explosion? People have been saying that the plume in her photo could have drifted closer to the pond, or much closer to her house by the wind if she didn't take the photo until 30 seconds to a minute, or so after the explosion. This, they say, would answer at least the question of why the trajectory of the smoke plume is off and seems to be much closer to her house. However in her video interview, she says that the FBI and her timed how long it took for her to take that shot which she says she took the photo only "approximately 5 seconds" after she heard the crash. Certainly not enough time for the plume to have traveled at all and makes you wonder if she was even able to take that perfectly lined-up steady shot of the plume. It is also hard to believe that she was able to think about jumping up and grabbing her camera to go shoot a picture and not ducking for cover from being startled and frightened from almost being knocked off her couch from a violent "house-rocking explosion" as she claimed happened. Val copyrights her photo and the Post-Gazette article mentions that Val says she has kept some of the proceeds from selling her photo at $20 bucks a pop, supposedly only for her legal fees involving her AP lawsuit. It also says that she uses the "honor system" to distribute her proceeds from selling her photo to the Heroic Choices foundation. Would you trust your work to use the "honor system" in giving you your pay? And think how much profit she makes on each photo. All she does when she sells them is print out an 8 1/2 x 11 color copy from her computer. Could that even cost her 50 cents for each copy? Both Val and the FBI claim her photo is authentic and she says her neighbors even saw the image still in her digital camera, though none of these neighbors she mentions were ever interviewed to corroborate this. She also says her computer was new and that she didn't have any photo-altering software. So if she did fabricate this photo, why? Did she have a big enough reason to risk criminal prosecution, lawsuits, and ruining her family and credibility forever? Well, it would appear so. In her video interview, she says right before 9/11, she had suffered "severe business loss" which had forced her husband's company, JCM Industries, to file for bankruptcy which they did just nine days after 9/11. She also mentions that they may lose their house and then goes on to say that they ended up shutting down their business on Dec. 31st. And if it could get any worse for her and her family, Val and one of her children were diagnosed with potentially life threatening and expensive health problems. Now think about that they might be, or already did lose their health insurance from their business going belly up. It's sad to hear that her family was going through so much trauma and I really hate to even bring it up, especially when they were going through major health problems, but you have to come to the realization that these were dire circumstances they were going through that could give someone who is desperate enough to think of devising a diabolical plan to cash in on a sure money maker, or even to be bribed into going along with a criminal scheme (think of the FBI taking her memory card.) Remember that Val has since opened up her own realty company (spring of 2005). Where did they get the money to do that? 1) She did say she saw a glimpse of the plane she heard fly over-head in the wrong direction of Flight 93's alleged path before the explosion happened right after she says it disappeared over the horizon. 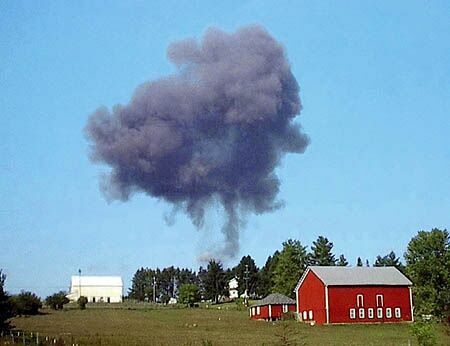 2) The smoke plume is characteristic of an ordnance blast. 3) The smoke plume is too big to have originated from the alleged crash spot and could only have originated much closer to her house. 4) She takes only one perfectly lined-up and steady photo only about 5 seconds after supposedly almost being knocked off the couch from and unexpected horrendous house-shacking explosion and not ducking for cover and also says she has her "new" digital camera ready by her door waiting for her friend to do a fly-by with a helicopter around the same time as the most unusual terrorist attack in U.S. history no less is very suspect to say the least. 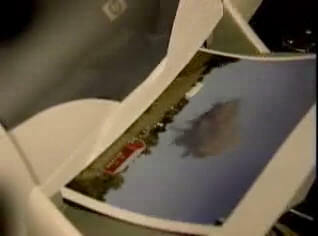 5) She has the photo in her possession for days until showing it to the police. 6) The FBI comes to her home and she says they gave her a story that they saw on her photo what appeared to be debris flying out from the smoke plume which they in turn take her camera's memory card with them. 7) Her family was going through a severe financial and health crisis right before 9/11 in which they had to file for bankruptcy and were in danger of losing their home. 8) She copyrights her photo, sells computer printouts of it for $20 each, uses the "honor system" to pay the charity what she promises, and admits to keeping some of the profits. 9) She opens up her new realty business a couple years later after they were forced to close their saw mill business and were in danger of losing their home. Any police detective would look at these facts and use them for their investigations. Investigations aren't always, if ever, pretty. I'm only making a case that there is a case. I really, really, really, really, hope Val and her family had absolutely nothing to do with it if it's ever found out that there was any kind of wrong-doing related to this photo. I really, really hope her photo is legit and she was simply taking a picture of a strange event, because that would mean there was an ordnance blast originating closer to her house which would prove some kind of conspiracy with the government. Unfortunately the facts seem to suggest otherwise and it just seems too unbelievable to think that Val took a photo of some kind of explosion and the FBI doctored it to hide what she really photographed without her knowledge. The one bright spot in this is I also find too hard to believable that the FBI had nothing to do with it if the photo has been doctored. They had her memory card in their possession and they claim her photo is authentic. Also, do you really think Val had the graphic art skills enough to make such a good forgery if it turned out to be a fake? Did she have help? Where did she, or her accomplice(s) get the picture of the ordnance plume? The FBI would have access to photos of ordnance plumes and I would assume that they also have access to great graphic artists too. They would also have good reasons to doctor a photo if they needed to hide something. The flipside about the FBI doctoring it though would be, why did they doctor it to make it look like it was an ordnance plume? Maybe Val did take a photo of an ordnance plume and the FBI knew they couldn't doctor it too much for fear that it would be too obvious that they changed it? As I said, quite a mystery. If it turns out Val was in on doctoring the photo, I'd like to think the FBI had found out about her extreme financial and health troubles that occurred right before Sept. 11 and they bribed her into going along with whatever reason why they decided to doctor this photo because they knew she was in such dire circumstances at the time and she saw it as her only way out. 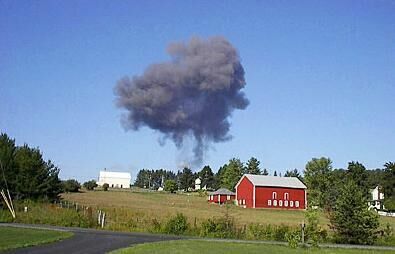 Either way, Val McClatchey's Flight 93 photo is a smoking gun whether it's a legitimate photo, or whether it's a fake.